With original 1-spindle and 2-turret concept, and tailstock that is servo controlled, this machine configuration for shaft machining of various workpieces. 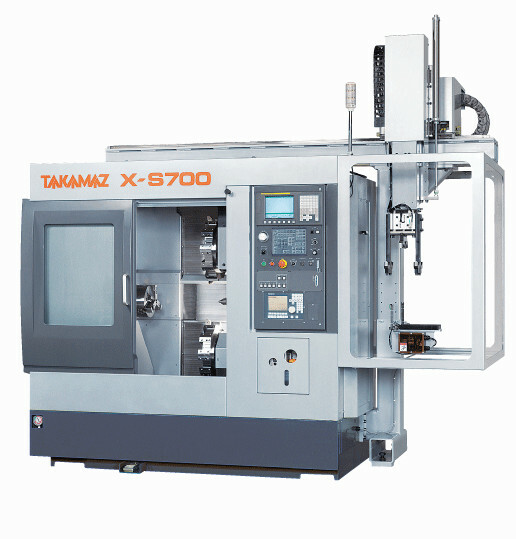 The Z-Axis has stroke of 650mm and a Max.700mm※ long shaft machining is possible. In addition, X-Axis with a 115mm stroke, can also support crankshaft machining. Through symmetrical twin turret design, balance cutting, simultaneous left and right individual cutting are possible resulting in individual shorter cutting times of diﬀerent shapes. The adoption of more rigid 10-station turret, more tooling is available. The vertical X, Z axis slides use a rigid square box-way slide, and in combination with large spindle: Ø120mm bearing bore(B specification) the heavy machining on the cutting area of 2.0mm2 is made easy.※When OD holder is used in a Ø100 spindle, up and down individual cutting is possible. To accommodate a long shaft machining and heavy crankshafts, the machine is equipped with spindle with capability of up to 10-inch chuck, 2 symmetrical turrets that can cut up to 700mm workpiece in length, and configured with MT-5 (B specification) tailstock. Still, the machine has only a machine width of 1,960mm, and floor area of 3.4m2. As compared with previous shaft cutting machines, this machine has approximately 25% less floor area while increasing manufacturing frequency by cutting with 2 turrets. The distance from the front center of the machine to the center of the spindle is 370mm, and the distance until the turret holder mounting face is 190mm. This is a good structured design. Therefore, tool changing is reasonably easy to perform. This square design is also focused on maintenance and also achieves a high safety.